Underground Coal Gasification or UCG is a mining method that extracts previously stranded coal reserves in situ (as it sits in the coal seam) through a gasification process that converts the coal into syngas (Synthesis Gas). 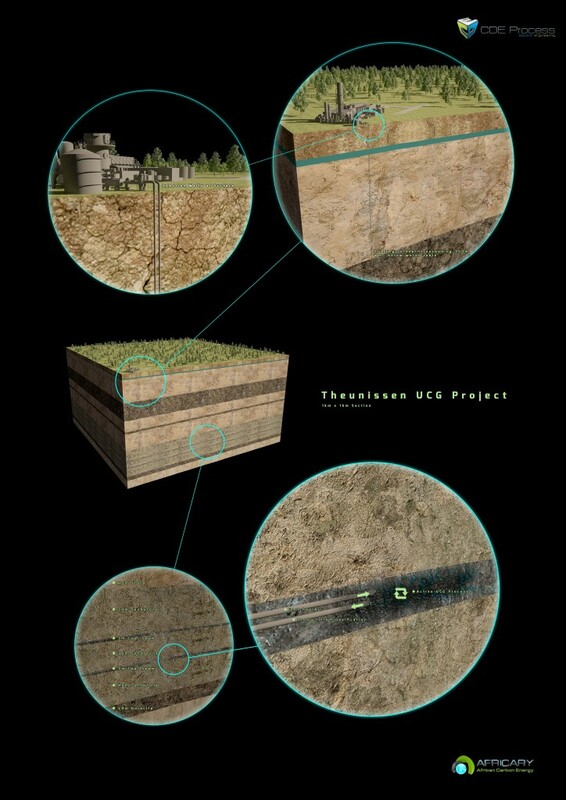 With up to two thirds of the planets coal reserves not economically mineable through traditional mining techniques, UCG offers a viable alternative to mine these deep coal reserves economically. It is important to understand that coal, like any other fossil fuel, is only a source of energy and that extracting the energy from the coal is equivalent to mining the coal and burning it somewhere else. In the UCG process a small portion (about 15 to 20%) of the coal is partially combusted underground, in a controlled environment, and the rest (about 80%) forms syngas. Syngas is a very valuable commodity as it is the building block used to make fuel like Sasol (i.e. petrol, diesel, paraffin) from coal, or it can simply be fed into a Internal Combustion Engine (ICE) or Gas Turbine (GT) for electricity generation. Two directional wells are drilled from the surface, down and through the coal seam where they intersect. One of the wells is the injection well, from which all the necessary components for production (i.e. oxygen) will be pumped in. The second well is the production well, from which the syngas is extracted.